On the bright side, she loves going to the library, and reading books. We read a Magic Tree house book together last week - which was long and I did most of the reading while she tried hard to keep paying attention and begging me not to stop... and her other five books she read very well partly with me, partly by herself. She truly enjoyed several of them. 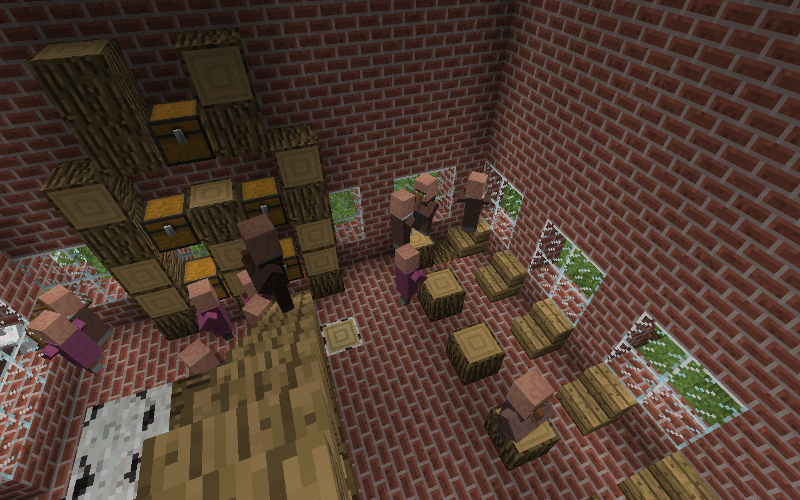 We have rewatched through all of the HP movies in order... so I told her the other day, in her Minecraft, I was giving her 'first level OWLs - or tests, to see how much she knew.' I put up signs with questions all over her castle room and she had to answer them for me. She has been reading and rereading her Kindergarten readiness brain games books Grandma gave her, so these were in a similar line. They were questions like 'What color is a ruby? ', and 'What is 3 times 3', and 'fish', 'dog', 'cat', 'umbrella', Which one doesn't belong? She had to read the question herself, and try to answer. She did really well, and enjoyed that - and built several hidden rooms with signs spelled out for me to find. I am glad to see her taking more of a stab at writing things out, and trying to spell words. She spelled DAV and GEF for names of her (Minecraft) animals on nametags... which she can't remember seeing the real names - but she sounded them out well. 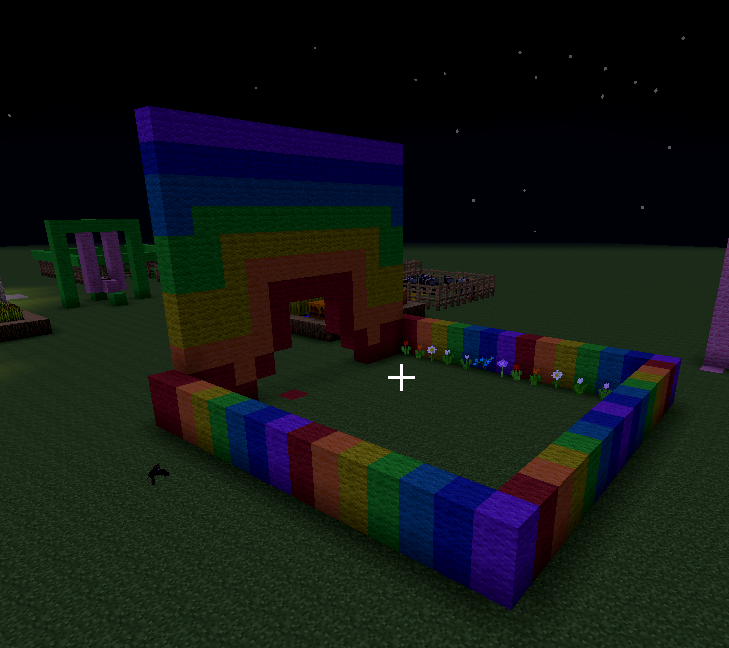 Tonight she built a rainbow garden before she went to bed - to add on to the rest mentioned above. House with porch swing, tire swing outside, gardens, animal corrals and 'egg nesting boxes' the green squares in the fence in the back. Tomorrow we go to the library and hopefully sometime later in the day I can start to think about and work more on the last dress and matching pants I want to make her before school starts. In contrast, I feel like we've gotten some things done... even though there is more to do. And, I feel she has made another 'leap forward' these past few months - which this is all stemming from... her thoughts have gotten wider and deeper... and she is a bit antsy to go to first grade - but worried at the same time because she doesn't know what it will be... ie: the 'practice' on her Minecraft etc. I don't get another day off until Friday.. and then it is just the one day - and not another until after she starts school on the fifth. Here we go... hold on to your hats and sunglasses... we're in for a ride. //Other little bits: I took a few minutes to look in a store today as I had to cut some time at work - and it felt like 'something' to be doing that I normally wouldn't allow myself time for. I was taken aback by the prices as always - forty dollars for a skirt like the ones I wear at home (handmade ones), six for a tank top, fifteen for a bar of soap in the cosmetics department... I really can't believe those prices... and knowing that I am not the kind to actually buy in a store like that - I feel like I don't even belong looking, at times... But, I do it because I continue to learn and get a feel for the styles that are being pushed at people now - the collars, the cuts, the ruffles etc... I saw a dress almost exactly like the fabric I am planning on making a top/pants set for Esme out of... similar cut to what I was thinking but lots more ruffles on that one. I had seen this dress in my mind's eye already and seeing that one confirmed the plainer style... but also neat and simultaneously strange to see something so similar to my idea on the racks already...at a place I haven't set foot in over a year. Garden harvest. That is volunteer Glass Gem corn, which I will try to dry out. Mark with his canned tomato sauce! We will be using this all year. 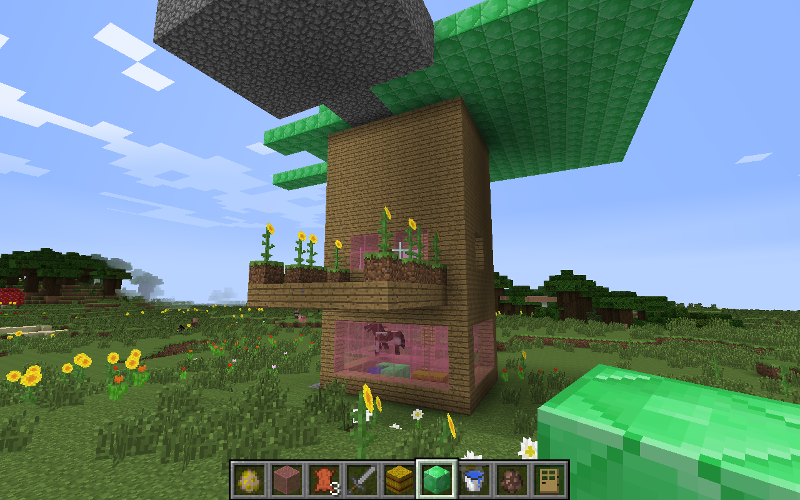 Esme's pink truck in Minecraft. It has a bed for having picnics in and a cab with glass and a strange 'vertical' hood thing going on. Over to the side of it she has a recreation of the beach we went to on the Fourth of July - with stairs down and sand. Little bits: The other morning Esme woke up and asked why we were downstairs by her room being so noisy. We told her we were checking up on the alligator Daddy had found and put in the bathtub. She went and looked tentatively..worried... There's no Alligator, Daddy! 'Oh - really? Did it get away? Where did it go?' She got even more worried and went back into her room to hide for a bit. We laughed! She came back out as I was washing my hair and poked her head in... convinced herself it was all a joke, and then brought me her Kindergarten start book with a picture of an alligator and said she had finally found it and everything would be okay. as a way of telling me she knew we were pretending. I saw her on the porch hugging the goat by the neck the other day. It was very sweet - they both seemed to be commiserating about being lonely. I think they both miss Tink, the kitten who died. I think they also miss having the puppies running around the yard. I miss them, too... it is strange to walk over the ground between the garden and the house and not have my heels chewed on. We think the older dogs have mostly forgiven us now for giving them all away... but they were pretty upset we took their entire pack of hard work and training and 'lost' them in the town that day. We let Esme play a bit in the small wading pool at her friend's house when we brought the aquarium. I told her she could wade, as we hadn't brought other clothes for her and didn't intend to stay long. A few minutes later she was entirely soaked and still had not done more than 'wade'. She jumped and sat down - stood up and yelled 'Sorry Mom!' across the yard. Her friend's parents asked 'What was that for?'.. I told her she couldn't swim, just wade. Oh, at least she said sorry, about it *giggle*... I told her it was okay, she could swim a bit now.. and they immediately started cannonballing each other and spraying the hose over each other. After about ten to fifteen minutes we said it was time to go .. she did get ready to go reluctantly. At home we filled up her pool again and she brought a little plastic doll out there to be her 'friend' until it was time for supper. 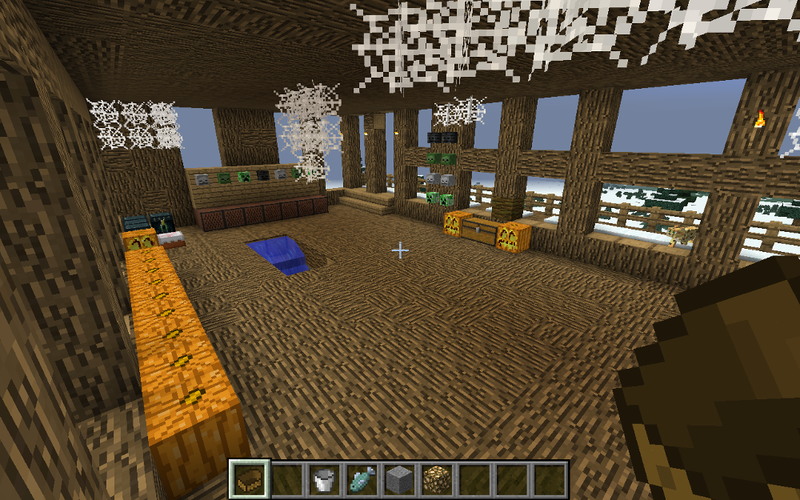 Esme's school room in Minecraft. There are books in the chest that can be written in by the player, and she has written little sentences in several of them. One of them is about bald eagles ;) Those are desks to the right and there are nap beds up on top in the 'kindergarten room' while the 'first grade' room next door has no beds. There are teachers and students. Bounty from the garden tonight. Esme helped with some of it. Sunflowers, tomatoes, cucumbers (including the lemon ones), beans, cowpeas, zucchini and a single banana pepper. Esme helped sort, wash and cut some of it up for a soup as well. She is learning how to do some more 'grown-up' things with using a knife (under supervision), peeling cowpeas and using a vegetable brush scrubber. Our tomato bounty waiting for another round of saucing! Esme and Mark sorting, washing and saucing the tomato harvest. Mark boiled some down and poured into jars the other day - another few jars today... and we hope to do a real canning run with it on another day. I am really glad with several of the matches we made on the pupies. Several of them just seemed made by Fate... from the moment the person saw the puppy they said - even when they said they didn't want one - that oh well, that one is coming with me, okay please? One boy in particular was getting back in his truck when he heard we only had a girl left.. and then I held her up in my lap and he stopped in his tracks, said wait.. err.. oh . she is PRETTY.....OK I'm taking her. These are the sleeveless dress tops I've made for Esme's first grade school year. There are a few more things on my list to make. I've completed two out of the four pairs of pants. 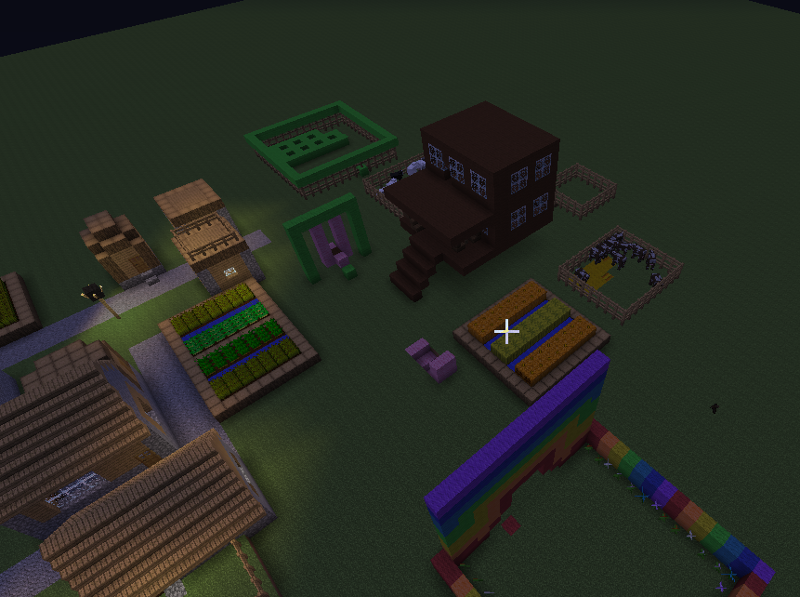 Esme says this is 'Horse City' - and she enlisted my help in making it a bit more than she had started out with - it now has a public library, grocery store, 'clock' tower with a pointy top, and her potions store, and my cloth store. 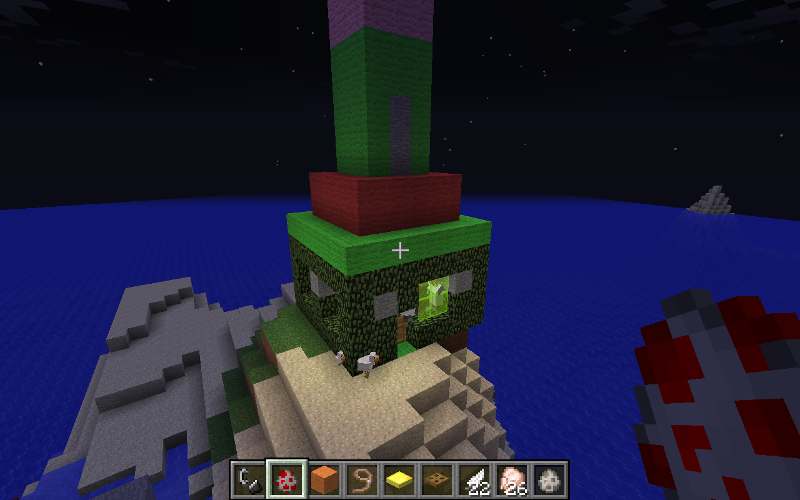 She put a big roll of purple cloth on top of the cloth store, and a 'bottle' on top of the potions store. She insisted on there being a playroom and bathroom in the library. 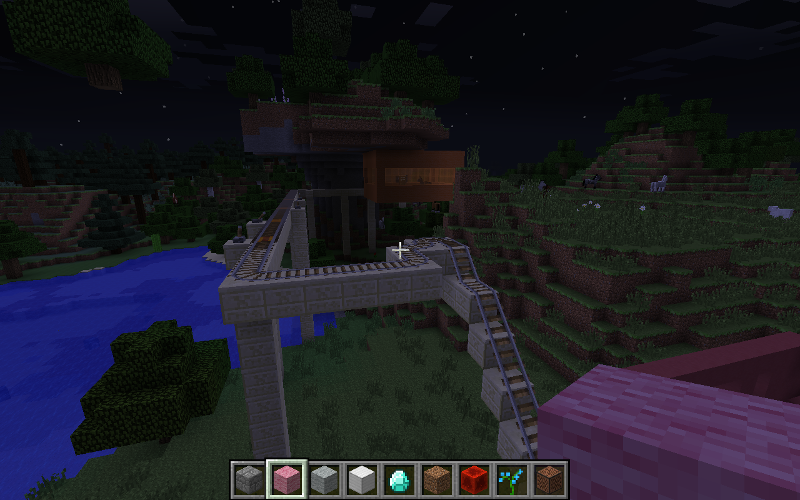 The rail system and house she built entirely by herself. Mark and I were both impressed by her use of powered rail and lever switches. She had a disagreement with me about the pronunciation of the word 'lever'... and didn't know why we laughed when she said we had said it wrong. We had to say goodbye to little Tink today, the little black kitten that wasn't even quite six months old. We really don't know what happened to him - but suspect he ate something bad, or something that had eaten something bad (like a mouse or bird)... he was fine at nine o'clock last night, and dead before seven o'clock this morning... with no apparent injuries other than throwing up on the floor. So very sad.. Esme had to see him as well before we took him out to bury him. She was shocked, but maybe felt better for knowing... his eyes were still open - and that bothered her a lot. Sorry to be so frank on all that.. it bothered me quite a bit, as well. I had just woken up from a jumbled type of dream before I went down to find him - sort of lost in time in my own mind not sure if my mom would walk down the hallway in her cotton nightgown or not - realizing that hallway was far away, in time and space, but really just around the corner in my head - sorting out that I was no longer a child, .. that my mom had died, and would not be walking in at all - that I was asleep and dreaming, that I was the mother, and Esme was downstairs in her room in symbolic contrast to what my sleeping self had remembered at the beginning of the dream.. that if she did walk in it would be as a ghost - and wondering why my brain was even in 'that place' right now. I backtracked to my dream self was thinking about she should be writing to my mom about Esme's school supplies and the end of summer/beginning of school -- it would be what I would do, as the 'change of season', to keep her updated, and send pictures etc.. an echo of things that I know would be happening, if things were different than they were right now. My dream self didn't want to write that letter, or make that call.. the procrastination of the past six months or so with Mom that I had such a hard time communicating with her I would put it off until I had the mental energy..... I didn't even remember at first with that that the real reason to not write was that she was gone - and then feeling that I could still tell her in the dream - that she was nearby, but I would have to locate her - but not wanting to go and 'find' her... and ending up in the time jumble of she is nearby, just down the hallway, in her room, any moment she will come down the hall and check on me... and forcing myself to right my thinking and wake up... I was about to pour a cup of coffee and come upstairs to write in my own dream journal about that dream.... when I saw the poor kitten laying oddly and not moving on the floor by the bathroom door. Esme wrote a note and drew a picture of him in her Kindergarten notebook.. which she dug in her room and found after Mark took him away - saying she had to get her dream journal and write in it. So oddly circular... strange day. Tomorrow we give away the last of the puppies, we hope... and I have the weekend off. Trying to fight a cold, myself.. tea and ginger. I have some of these done - but no pictures yet. So, for now - I am just posting the list. School starts in about three weeks -- I have to get cracking. 1 Long sleeved 'fancy' dress - I'm thinking a repeat of her purple flower ruffled one from last year. // I am using a lot of the fabric I received from the lady at work a few months ago, and need to replenish a little bit of thread in order to get the rest of these done. Her pants are so long now it is hard to find a piece of fabric that will cut all of the pieces out... that is the hardest. The dresses are a bit easier as I can split the pieces up and find ways to make them work out of two fabrics. I've put the sunflower head in a paper bag to dry out for chicken feed, and the purple gladiolus is in a vase. She was so happy that it snowed. Mark says: 'Our produce has produced.' 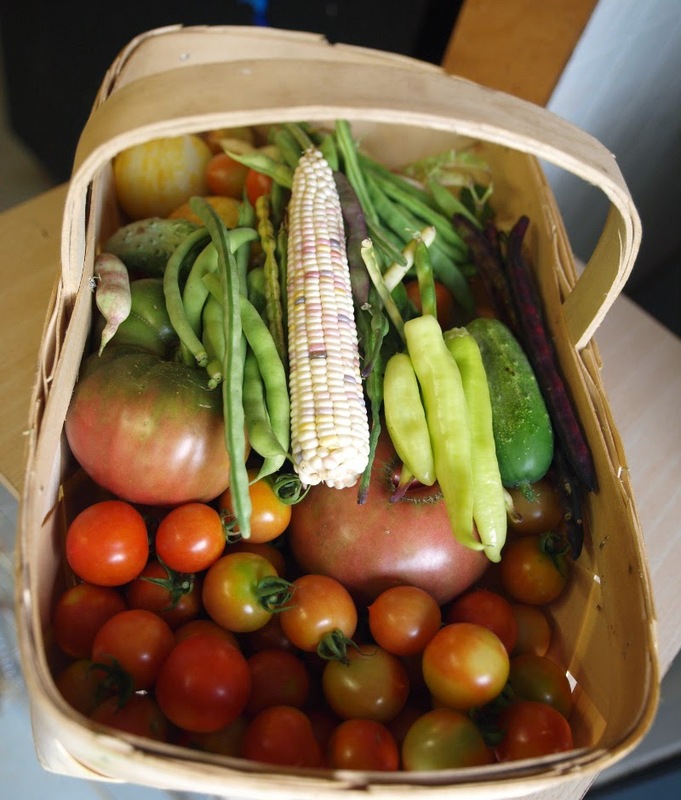 We have some tomatoes to pick out there, too - but first to blanch and bag all of this and put it in the freezer! Snoopy (shown below) and the black kitten Tink would not stop coming into the garden with us. At one point Tink had put his head inside the bottom of my pants leg and was sitting there purring because he felt like he was getting attention by being that close to me. Silly... I kept telling him he was a black caterpillar corn worm and we really had to do something about those before they eat the crop! Esme with Snoopy puppy, one of Nova's - and a bluetick coonhound mini-me! Different kinds of beans in the garden - Provider green beans on the left, straight and round - the White climbers I was trying out again from the odd seed that showed up last year, purple Shackamaxon and the Rattlesnake beans with tiny purple stripes, which makes it so easy to tell the difference! Mark did a major floor cleaning in the kitchen and hall yesterday, and all of the laundry. I followed suit today with a major cleaning in Esme's room... it needed it badly. She had rocks and sticks stashed in toy boxes, one toybox had a hole in the bottom of it that water had gotten into.. some boards that had water and mold on them underneath...stashed candy in plastic bags inside toys and empty boxes scattered around, paper, school hats and cards and it wasn't really possible to walk in there without falling over anything. I made her help me organize after the worst of it was done - spray down her dollhouses which were full of dust and grime, empty and spray out her garbage can, collect up and throw out anything food (except a few recent things from sleepover bag which went on her dresser), gather jewelry, her purse (she couldn't find it last week and so couldn't buy anything), teaset stuff, play food, my little ponies, playmobil people, stuffed animals etc etc etc... It ended up looking, smelling and being SO much nicer in there you could almost believe it was new! We moved her dresser and changing table, got a dress-up station set up and took out some things she had outgrown, as well. We also went to the fast food and park in McKenzie with Grandma - and she ran a lot of energy off. Even with taking five kitchen bags of junk/paper etc out of her room she was on excellent behavior all day. In fact, I think she appreciates her room a bit again.. heard her in there playing cars on the floor and she has her Dreamlight again to use at night because it had slipped behind her bookcase and she didn't know where it was. 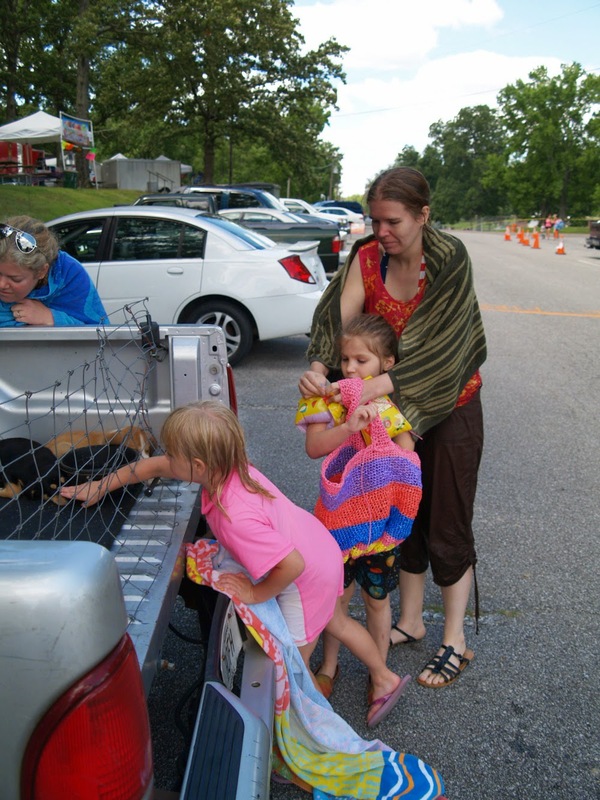 We went to the state park today and the girls got to go swimming, and then have a short picnic. The weather was mild, so the water was COLD.. but they still had fun. G and her mom joined us and then we walked some of the puppies on leashes out in the grass across the way. Pulling off the water wings - we soon changed after this as the sun was going behind clouds and it was freezing, especially while wet. 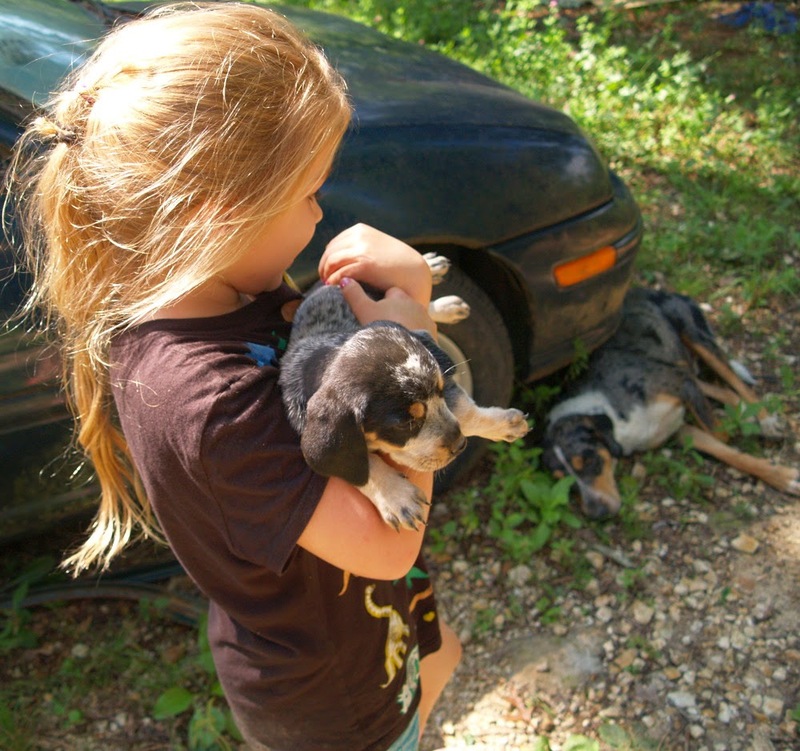 Petting a few of the puppies. Walking the puppies around in the park. The girls and the pups all did very well. I haven't been doing much myself, working odd shifts and we do plan on doing something tomorrow that is pretty intensive. 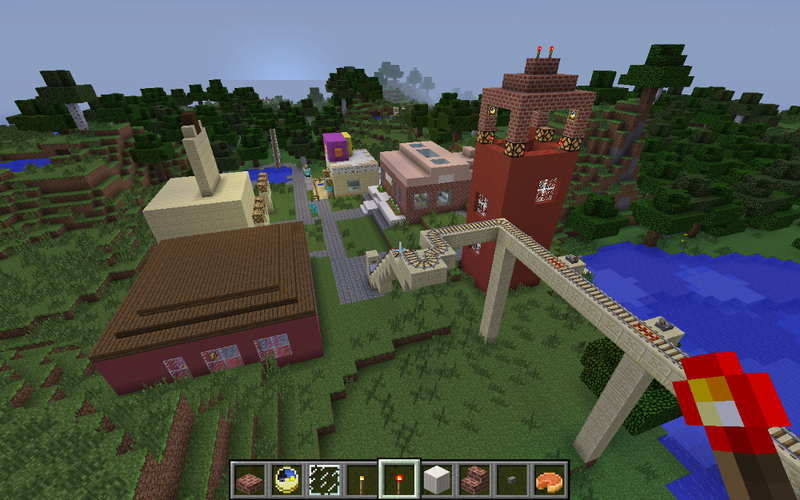 Esme has been biding the time with Minecraft and playing with puppies and outside. 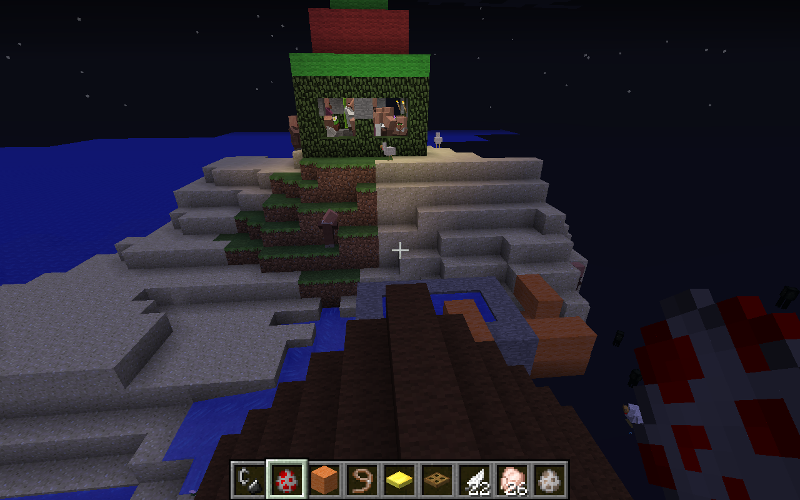 She is getting quite detailed again with the Minecraft! 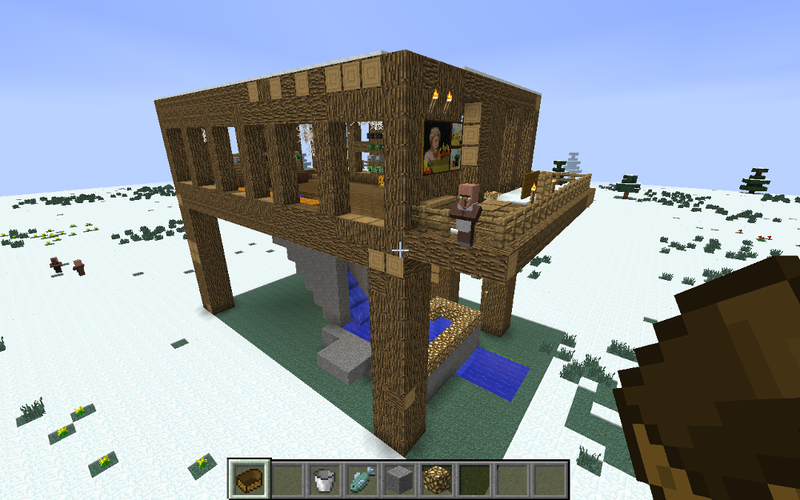 We built this one sort of together yesterday - it extends for three rooms behind and has a garden. It is a 'sleepover house' with lots of beds in the middle room and a cow viewing area in the front with a sign that says 'cows.' She says they need milk for breakfast. 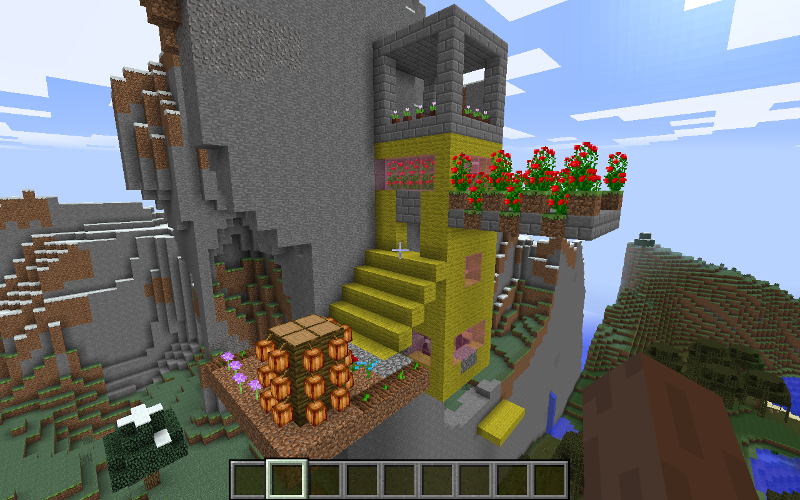 A house with a horse viewing room on the bottom, a sunflower garden in the middle, and a large 'dance floor' and pool on top. This was this morning, with two garden rooms, a side garden that has cocoa beans in it (exactly like we had built in the pink house above), and a lower horse viewing room again with haybales and water. She built this one out of the side of a mountain. Esme's flower shop with all sorts of flowers and customers. 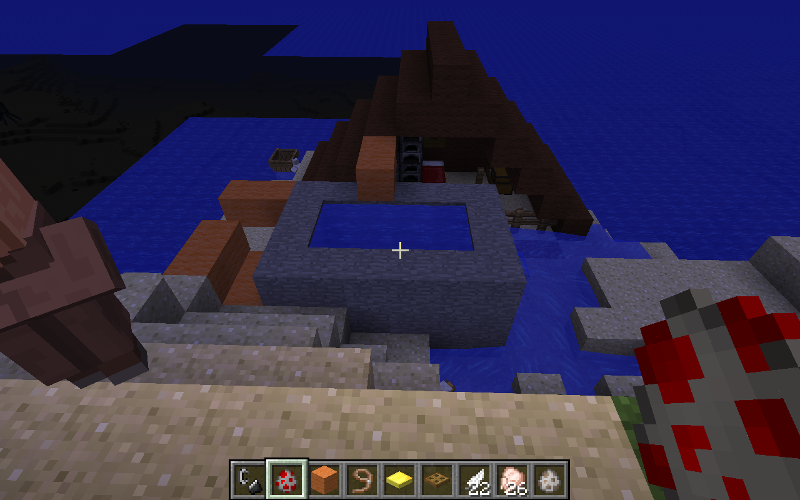 A tent by the beach - with a boat, a bed, a trunk, furnace and a pool with a diving board. 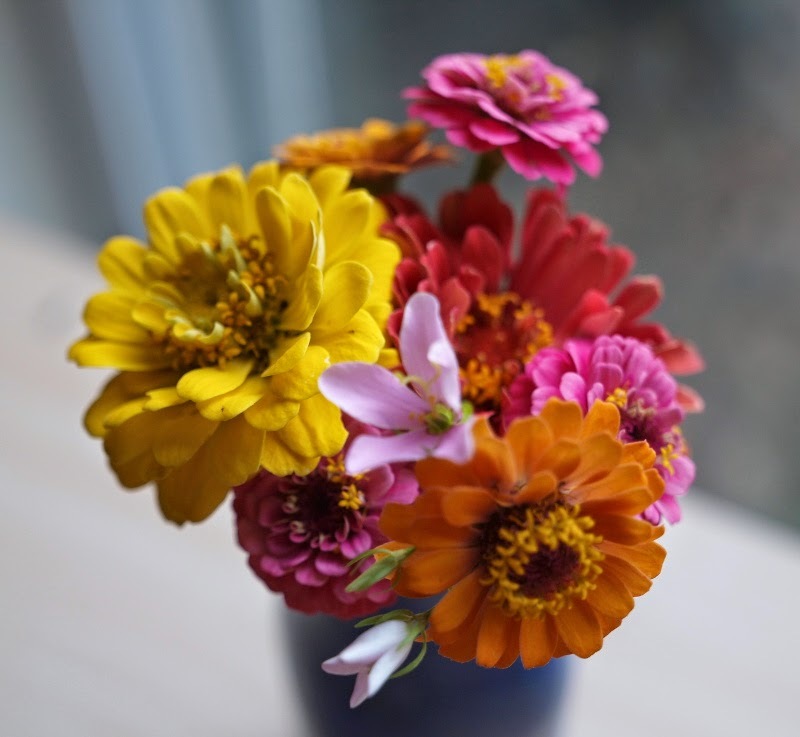 She can stay in the tent with her dog (who was in a trapdoor under the bed - but escaped), and then go swimming, and then go work in the flower shop and go to sleep after at night. She has made quite a few things, but this was a nice little set and she had spent quite some time on it.